Preheat the oven to 375 degrees F. Boil the potato slices in salted water until they are not quite completely cooked, about 5 minutes. Drain and set aside. 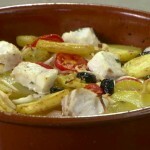 Grease a claypot or baking dish with the olive oil and place the fish in the dish. In a medium bowl, whisk together the 1/4 cup olive oil, garlic, thyme, lemon, salt, and pepper. Add the onion, tomatoes, olives, and potatoes. Toss gently to coat. Pour the vinaigrette and vegetables over the fish. Bake in oven until fish is cooked through, about 15 minutes. Meanwhile, brush the exposed lemon quarters with a little olive oil, and in a small grill pan, grill the quartered lemon sections just to give a hint of charred color. Serve the fish with grilled lemon wedges.